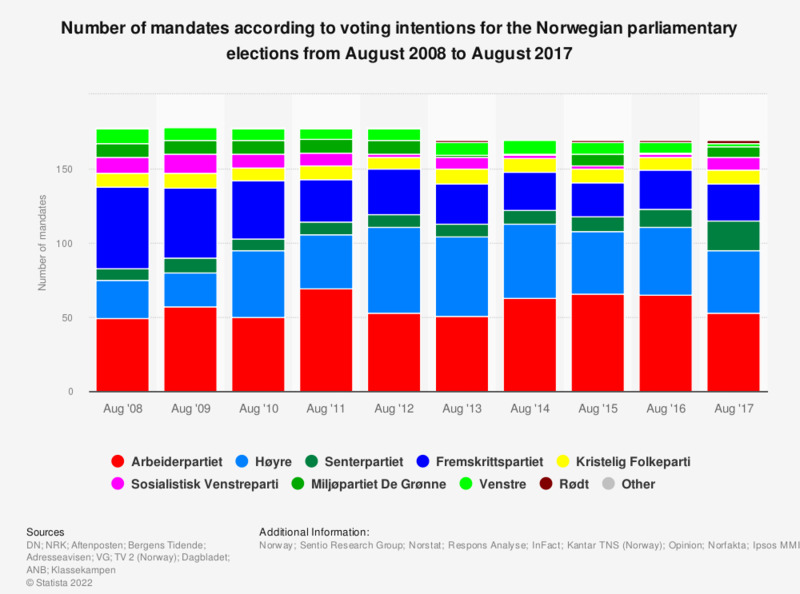 The statistic shows the number of mandates according to voting intentions for the Norwegian parliamentary elections from 2008 to 2017. The surveys on the current voting intentions for the Norwegian parliamentary election were conducted annually on a monthly basis by different market research companies in order to determine voting intentions for Norwegian political parties. A selection of Norwegian voters were asked to give their vote as if the elections were taking place today. Shown here is the number of mandates calculated according to voting intentions in August in each year. In August 2017, the social-democratic party 'Arbeiderpartiet' would have received 53 representants in the Parliament. The conservative party 'Høyre' (42 seats) and the liberal 'Fremskrittspartiet' (25 seats) ranked second and third respectively. The voting intention results of 2013 do not reflect the received mandates of the political parties during the Norwegian Parliament elections on September 9, 2013. As the outcome of the elections, 'Arbeiderpartiet' received 55 seats in the Parliament, followed by 'Høyre' (48 mandates) and the liberal party 'Fremskrittspartiet' (29 mandates). This statistic is based on surveys on voting intentions for the Norwegian Parliament elections among Norwegians ages 18 years and older. Surveyed respondents were asked to give their vote as if the Norwegian Parliament elections were taking place today. According to the share of total votes of each party, the number of mandates was calculated. The number of survey participants for the individual years is not provided by the source. Everything On "Parliamentary election 2017 in Norway" in One Document: Edited and Divided into Handy Chapters. Including Detailed References. Statistics on "Parliamentary election 2017 in Norway"
Which party do you like best at the present time? Which of the political parties do you want to have in the government the most? To what extent do you agree that you would be more likely to vote for a political party in the United Kingdom (UK) that demonstrated how it would implement its policies in government? To what extent do you agree or disagree that the political parties in the United Kingdom (UK) keep their election promises?